Our eshop is back up and running. To kick things off, we’re giving you a flash sale of 70% for The Girl Who Twisted Fate’s Arm. Don’t forget to use the coupon code CERTIFIEDMYTHOGRAPHER during checkout for a 5% discount. The February Sci-Fi Mini Sale – 3.99 or less has begun today! The FEB 40% Sale has begun today! Get Our Massive Halloween Countdown Deals on Amazon! This Halloween we’re running a massive countdown deal on so many titles. Here’s the seasonal one you simply can’t miss, Boo! The countdown deals start at the 30th of October from$0.99/0.99£ but you should check out the product pages for the current price. The deals are valid on Amazon US and UK. Check them all out, and if you’re seeing this too early Join the Mythographers to get a reminder on your email. Get the Massive Smashwords Monthly Sale ? It’s time again for the semi-annual Smashwords sale. This month only, they offer thousands of ebook titles at massive discounts of 25%, 50% and even 75%. Last week we’ve had a rare partial Lunar eclipse that was red. Reddish. Quite a unique spectacle. The eclipse was visible from Asia to Europe, sometimes appearing red in colour as the Sun’s rays shined on its surface. The phenomenon happens when Earth passes between the Sun and the Moon – casting the Earth’s shadow on the Moon and obscuring it in darkness. When only a small part of the Moon is obscured, the remaining rays of Sun can light it up a bright red-orange – the same refraction effect that makes a sunset look red. You can read more on BBC news. So we figured, it’s time to get loony. We’ve put everything at 99 cents. Or something close to that, dirt cheap, if it’s a boxset or something. So, go on over to the title you’re missing from your library and buy it on sale. 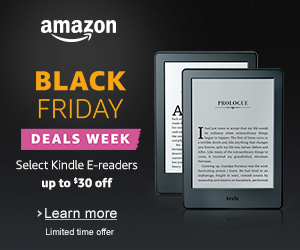 Amazon has sent out these amazing deals on Kindles for Black Friday. This is the best chance to nab that Kindle you wanted, or just offer someone you love the gift of reading.